If you have Virtual Machines (VM) running in azure, you can take advantage of discounted pricing on Reserved Instances (RI) and pre-pay for your Virtual Machines. Microsoft consumption recommendation apis looks at your usage for seven, 30, or 60 days and recommends optimum configurations of Reserved Instances. It calculates the cost you would pay if you did not have RI and cost you will pay with RI optimizing your savings. The following example shows calculations that happen for 7 day recommendation but the same method is applied for calculating 30 or 60 day recommendations. Let us assume your hourly windows VM usage for a specific SKU and region looks like the following graph (min. is 65 units and max. is 127 units) for seven days. 75 Instances of Reserved Instances. This will be pre-paid when you purchase RI. Reserved Instance covers the hardware cost of running VMs, so you will pay 75 hours of software only price as described in the document for Windows software costs not included with Reserved Instances. Since usage for this hour is 80, you will pay for five hours of (windows + HW) combination meter price. This will be your negotiated price if you are an EA customer or it will be pay as you go price. If you add up the costs described in three points above for all the hours, you can calculate the total cost if you purchase 75 RI. You can also calculate your current cost using your negotiated prices in case you are EA customer or use pay as you go prices if you do not have custom negotiated prices. Difference in these two amounts will give you savings for seven days in case you purchase 75 RIs. Microsoft Consumption Recommendation api does these calculations for each specific usage point and returns the Recommended Quantity where your saving is maximum. 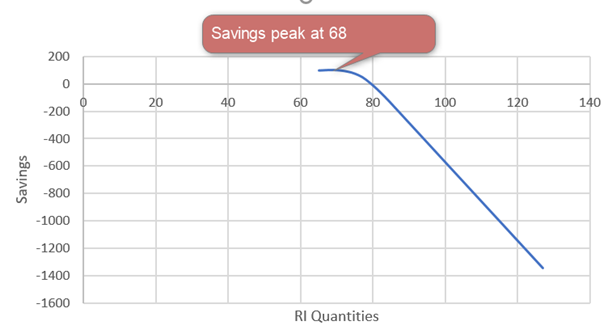 In this example, below graph shows that your savings peak at 68 and then start reducing so the api will return 68. If your current usage for Windows VM is not using hybrid use benefits, api will NOT assume that you will use hub and recommendation will factor in the per core cost of windows IP. You can use hub and further increase savings. Future versions of the api will give recommendations on hub savings also. If you are using a look back period of seven days and your VM ran for the first two days, then was down and again ran for the fourth day. You may or may not see in the recommendations depending on RI discount. You can get the details on calling the recommendation api for your Enterprise enrollment. Use hybrid use rights to save on cost of windows software.